hmm... I think it's been longer than a week, what is MateoConLechuga working on? Mario for the CE? or some other project? 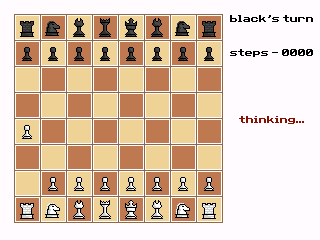 How are you keeping the AI from taking hours to make each move? Wow! Great work Mateo! Just out of curiosity, do you plan on making a mode where you can link calculators and play chess across the link? I don't mean to imply that you need to do it now, I just would like to know if that is a future plan. Also, could you put a version number on the program so I know if I need to update chess? I realize this is a lot to ask, you just came out with this program. I'm sorry about this, however these were questions I just had to ask. Again, Amazing work and keep programming! To answer your first question, I believe Mateo is working on some sort of a USB linking library for C programs, (this is written in C) so eventually, when he has that made, link play could be implemented. There probably is a way to implement it without a new library, but I'm not exactly sure. Umm, but to answer my question. Are you planning on making a 'link' game mode, Mateo? If I knew any other programming language than Basic, or even understood half of what you just said I would try! i downloaded this game and ran with PHASM and every time i exit this game my calculator resets its RAM.please help me i really like this game and would like to play it without RAM resetting every time i exit. I have too many legos. soft-mods: PSvita FW 3.60 running HENkaku, PS3, and Nintendo Wii. other things: RPI 3B with retropie 4.2. In the settings menu, when you DIDN'T select "human v calc" there is a white line through "play as" and its option, but that line is white, and it looks like that is a bug or so, maybe you can change that linecolor? © Copyright 2000-2019 Cemetech & Christopher Mitchell :: Page Execution Time: 0.114755 seconds.